Neil Harman, plagiarism: More examples of Wimbledon plagiarism from the Times of London writer. Documenting Times of London writer Neil Harman’s extensive Wimbledon plagiarism. 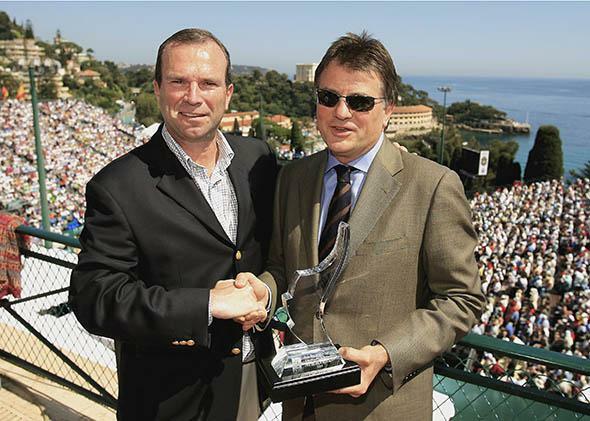 Journalist Neil Harman of the Times of London receives the Ron Bookman media award from Etienne de Villiers, then-chairman of the ATP Tour, during the Monte-Carlo Rolex Masters on April 22, 2006, in Monaco. On Wednesday, I reported on the serial plagiarism of Times of London tennis correspondent Neil Harman and on how Wimbledon continued to sell its annual yearbook even after discovering Harman’s pilfering. I found at least 52 instances of plagiarism in Harman’s writing for the 2011, 2012, and 2013 editions of the Wimbledon yearbook. In Wednesday’s story, I included just three examples. Here are five more that help illustrate the extent and manner of Harman’s copying. Instead of Nadal, the man across the net was the 27th-seeded Philipp Kohlschreiber, who can walk through Wimbledon village and a lot of other villages undisturbed. Instead of calm, there was a breeze: shifting the big white clouds overhead and tugging at Rosol’s shorts and his huge flat shots. And instead of a follow-up victory after a huge upset, there was—as is often the case in the head game that is tennis—a quick tumble back to planet earth. “Of course I was hoping he’s not having that day again against me,” Kohlschreiber said after his 6–2, 6–3, 7–6 (6) victory. Instead of Rafael Nadal (who was back in Majorca), the man across the net was the No. 27 seed Philipp Kohlschreiber, who can walk through Wimbledon Village and a lot of other villages undisturbed. Instead of calm under a roof, there was a distinct breeze: shifting the big white clouds overhead and tugging at Rosol’s shorts and his huge flat shots. And instead of a follow-up victory after a huge upset, there was—as is often the case in the head game that is tennis—a quick tumble back to planet earth. “Of course I was hoping he’s not having that day again against me,” Kohlschreiber said after his 6–2, 6–3, 7–6(8) victory. Still, this “Where Eagles Dare” approach left Williams in such a lather that, after half an hour, the American was already 5–1 down. Williams responded by powering down serves of up to 120mph but Date-Krumm kept bunting them back with her peculiar pancake forehand, which she hits in such an unassuming style that she might be wielding a frying pan rather than a racket. If this woman had turned up at the auditions for Wimbledon the movie, she would have been turned away for looking nothing like a tennis player. “You don’t really get a rhythm against her,” said a relieved Williams afterwards. “I have never played anyone who hits the ball like this, or who comes to the net as much as she does.” Asked whether Date-Krumm was flying the flag for the more experienced women in tennis, Williams replied “She’s a huge role model.” Shere Hite has always said that women reach their peak at 40. Williams walked on court in the same costume that she wore in the first round: an embroidered romper-suit that appeared to have been constructed from a pair of net curtains. (At least her opponent might have been old enough to recognise the 1970s style reference.) But her drapes were drooping by the later stages of the match as Date-Krumm displaying the sort of stamina that a teenager might envy. The Japanese had already given evidence of her mental strength in the first set, which she took on a tie-break after Williams had saved no fewer than seven set points. The standard might have dropped a little in the second set (Date-Krumm later admitted that her limbs had felt heavy at that stage), but the third was another humdinger. And with the roof reflecting back the sound of the crowd’s applause, the atmosphere on Centre Court became quite feverish. Still, this ‘Where Eagles Dare’ approach, to use the words of the Daily Telegraph’s Simon Briggs left Williams in such a lather that, after half an hour, the American was 5–1 down. Williams responded by powering down serves of up to 120mph but Date-Krumm kept bunting them back with her peculiar pancake forehand, which she hits in such an unassuming style that she might be wielding a frying pan rather than a racket. Williams walked on court in the same costume that she wore in the first round: an embroidered romper-suit that appeared to have been constructed from a pair of net curtains. (At least her opponent might have been old enough to recognise the 1970s style reference.) But her drapes were drooping by the later stages of the match as Date-Krumm displayed the sort of stamina that a teenager might envy. The Japanese had already given evidence of her mental strength in the first set, which she took on a tie-break after Williams had saved no fewer than seven set points. The standard might have dropped a little in the second set (Date-Krumm later admitted that her limbs had felt heavy at that stage), but the third was another humdinger. And with the roof reflecting back the sound of the crowd’s applause, the atmosphere on Centre Court became quite feverish. There were no tears this time, but there were squeals of imprecation and shrieks of irritation. The defending champion, Serena Williams, struggled badly at the start of her second-round match, losing the first set to Simona Halep of Romania. That stung Williams into life, and the American won the match 3–6, 6–2, 6–1. But in the beginning she was playing so far below her best that it seemed likely she was heading for elimination. In the first set Williams was bamboozled by Halep’s serve, such that her returns were either shanked sideways or ballooned back over the net. Here are the same paragraphs in the 2011 Wimbledon annual. Again, I’ve chosen an excerpt here in the interest of brevity, though Harman borrowed much more. There were no tears this time but there were squeals of imprecation and shrieks of irritation. The defending champion struggled badly at the start, losing the first set which stung her into life and the American won 3–6, 6–2, 6–1. But in the beginning she was playing so far below her best that it seemed likely she was heading for elimination. These two previous passages are typical of the plagiarism in the 2011 book, which had the most examples I found (30 of the 52). The plagiarized snippets from 2012 and 2013 were generally shorter—not entire articles at least. The shortest example of copied language I found came in the 2012 book, when the phrase “In Act II, with the roof drawn back to let in the meagre sun” (written by the Guardian’s Kevin Mitchell) also appeared on page 114 of Harman’s annual. Radwanska broke her easily with a focused, crafty game, but she just couldn’t find a way to break Lisicki’s booming serve down the stretch. With a second chance to serve for the match, Lisicki made no mistakes. She fired a forehand winner on match point and collapsed to the ground in tears. Radwanska broke back easily, however, with a focused, crafty game, but she just couldn’t find a way to break Lisicki’s booming serve down the stretch. With a second chance to serve for the match, Lisicki made no mistakes, firing home a forehand winner on match point and collapsing to the ground in tears. Both the Guardian (which Harman plagiarized 28 times) and the Telegraph (which he plagiarized four times) have now written stories noting the writer’s plagiarism. Harman’s employer, the Times of London, has yet to comment officially. In the meantime, on Thursday—the day after Harman resigned from the International Tennis Writers Association on account of what he described as his “shoddy work”—the Times published two articles written by Harman. Correction, July 24, 2014: The caption of the image in this piece misstated the name of an award received by Neil Harman. It is the Ron Bookman media award, not the Roy Bookman media award. Update, July 25, 2014, 10:25 a.m.: Neil Harman has been suspended by the Times of London “pending an investigation into allegations of plagiarism in another publication,” according to a Times spokeswoman. Harman has also deleted his Twitter account.